The elements of the Measure Phase naturally lead into the second phase of the CEMDNA Playbook Strategy: Analyze. This is where companies dive deep into the data they have collected to "mine for gold" using sophisticated analytics tools and techniques. The primary focus of BI is generating actionable information/intelligence about critical business operations. This includes information that is both company and CEM specific. The ability to segment information by account type (Tier I Tier II Tier III) and contact type (Decision Maker Recommender Influencer) are the two key fundamental actionable components necessary to drive customer loyalty. BA refers to the data-driven practices, skills, tools and techniques for continually analyzing business performance and exploring new ways of gaining a competitive advantage. BA provides actionable insight relative to decision makers, recommenders and influencers according to loyalty and satisfaction scores. BA also makes it possible to combine satisfaction and operational data to gain further insight into purchase behavior by nature of the job or role within a customer organization. In this process, you develop a barometer that allows you to see how your organization compares on various dimensions such as CEM measurements with others in your industry. If you want, you can apply benchmarking to compare your performance with best-in-class organizations in other industries. Benchmarking is a valuable "reality check" that lets you know how you stack up with your direct competitors and overall leaders in business in general. Top 10 Best-in-Class companies in all industries. You can benefit from successful CEM practices from companies even if they're in a completely different industry. 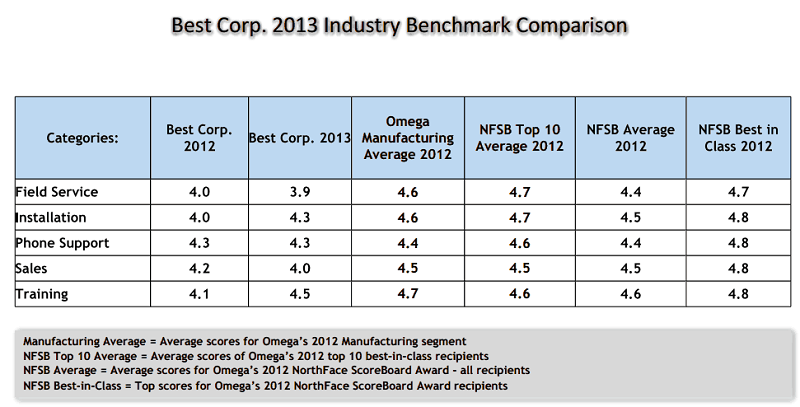 NorthFace ScoreBoard℠ Recipients This is Omega's own group of "world class" customer service organizations whose own customers have rated them as consistently exceeding their expectations for service quality.